I recently picked up a Certified Pre-Owned (CPO) Tesla Model S (part 1 and part 2 of that story), and in the first month, drove it across the US, gave the Supercharging network a serious workout, and have already converted a few new EV enthusiasts along the way. Unfortunately, in that same span, I have also had to invoke the warranty for a minor repair. Thankfully, Tesla is very different when it comes to service and it was one of the least painful interactions I have had with any company in recent memory. 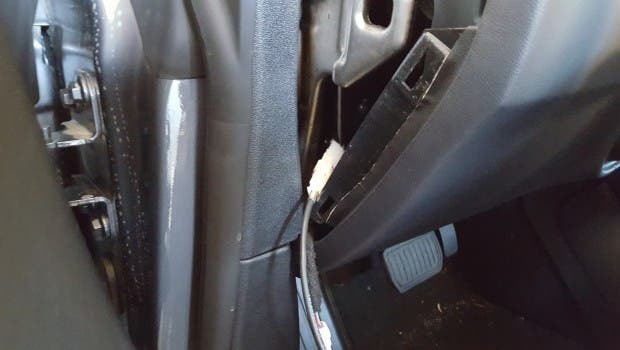 The repair was nothing major — the rear passenger door handle wouldn’t always work when attempting to open the door. Tesla door handles do a few things: They typically pop out when the key is detected in the proximity of the car. If they don’t detect the key, they can be touched to manually request that they pop out (presumably after looking for and finding the key in the area). And finally, when gently pulled on, they trigger the door to open. They way they open doors is different than “normal” doors, which are actually mechanical levers that physically unlatch the door. Tesla handles, on the other hand, are just sensors. When they detect a tug, they send a signal to the car to pop a solenoid that releases the door. With the higher level of complexity, these are more prone to failure and, given the relatively early model that I have (with a serial number less than 9,000), I’m still on the early side of the learning curve for some of the more failure prone hardware components. After a few failures and with my two little boys having taken up near-permanent residence in my rear seats, the handle became more of a headache than I was willing to tolerate. 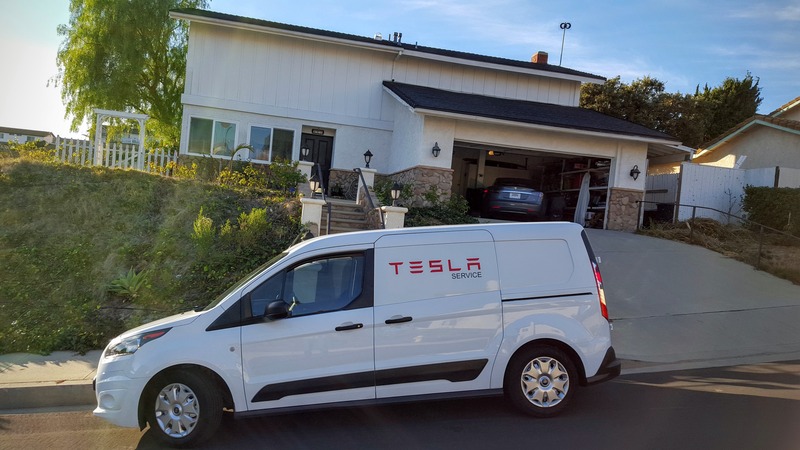 I will unpack the Tesla support process more thoroughly in a future article, but the early learnings I wanted to share relate to the way the Ranger (yeah, Ranger!) connects to, talks to, and updates the car as part of a normal service appointment. For my door handle change, one of the first things I learned was that they had to update my Model S firmware. This confused me a bit, as I was already running v7.1, but having worked as an IT project manager for many years, deploying a variety of solutions around the globe, I realized he was referring to a minor revision of the same major revision (7.1) of the firmware. This was interesting to me, but makes sense given the complexity of the cars and the fact that they operate much more like a smartphone than a typical car. To perform the update, the service tech cracked open the panel on the right side of my dash and jacked his HP laptop into a mystery port in the black hole of my car. After making the connection, the service tech went back to work on the door and I went over to explore the wonderful world of service screens. It was immediately clear that the laptop was ready to load new firmware into my car (or part of my car), as it was in a screen talking about sideloading firmware with different versions available. I later learned that many of the individual hardware components also have their own firmware — just as smartphones do (a recurring theme here) where a modem has different firmware than the WiFi radio… and can have different versions even within the same major version of firmware. The laptop itself was running a Tesla proprietary application called Toolbox (how original) version 2.0 r0040. The software on the laptop looked fairly standard, with the firmware update screen being front and center. A few other options — like Tires and Suspension, Safety, Steering, and Driver Assist — sound interesting, but without details, it’s hard to say what they allow. When I first glanced at my touchscreen, it looked like there was a black, boring status message pulled up, which I assumed said something along the lines of, “connected to the laptop, ready to take orders,” but a closer look revealed that I had, in fact, gone down the rabbit hole and this was just the beginning…. With the laptop connected, the main display in the car indicated that my car had gone into service mode. I soon realized that I was looking at a completely new set of menus with options down the left and tabs across the top. After a bit of probing, I also realized that this new screen was able to go full screen (vertically), displaying TONs of information about my car. 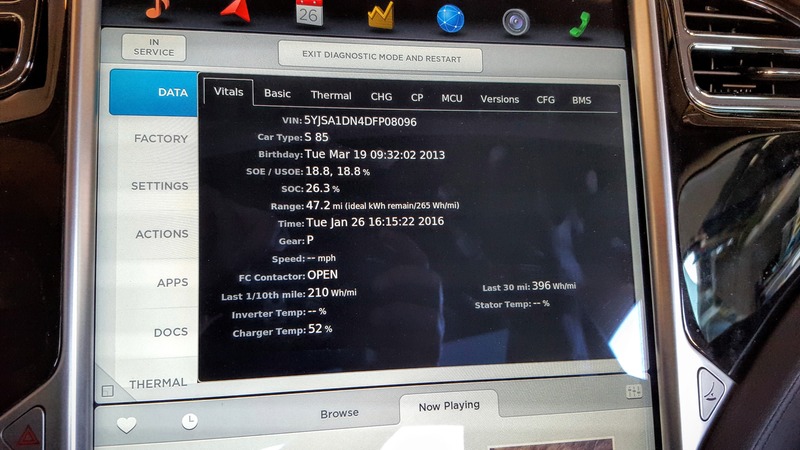 My favorite was the birthday — I found out that my Model S was born on Tue, Mar 19, 2013, at 09:32:02. 🙂 This information can’t be found anywhere in the normal user interface and was fun to see. The Apps tab shows that Tesla seems to be getting ready to push out Spotify to Teslas in the US, as it includes a Spotify Test app. Spotify Premium was awkwardly deployed to all Tesla owners outside the US with the 7.1 firmware update, but stateside users were denied the bonus, presumably as a result of more complex negotiations in the home markets for both products. There are also a handful of other apps available — Image Viewer would be helpful, though maybe a bit too distracting to be safe. Jumping down to the thermal tab revealed a full-screen thermal flow map of the Tesla Model S, including battery cooling loops, comfort heating and cooling, passive and active cooling triggers, dual chargers (only one being utilized on my 110 home charger, which was plugged in and pulling a staggering 12 amps), and the drive unit/inverter. The thermal flow map appears to show how heat and cooling are managed amongst the various components that generate or consume heat. 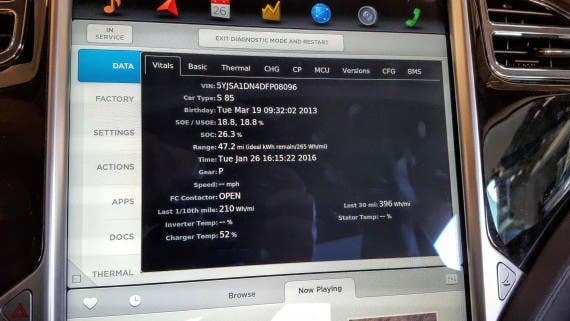 Batteries operate when held at an ideal temp, which from the picture appears to be between 28 and 29 degrees C.
From the images, it is all the more evident that the Model S is wired up more like a smartphone with sensors everywhere, firmware for each piece of hardware, and tons of minor revisions of updates happening all the time, transparent to the driver. The Data tab had one of the most dynamic screens.